Alejandra Pizarnik was born to a family of Russian Jews who had fled to Argentina to escape the Holocaust. She attended the University of Buenos Aires and studied philosophy, journalism, and literature. She also studied painting with Surrealist painter Juan Battle Planas. She published her first book of poetry, La tierra más ajena, in 1955. She was strongly influenced by the French Symbolists, especially Arthur Rimbaud and Stéphane Mallarmé, and her work reflects frequent themes of childhood, pain and death. In 1960, Alejandra went to Paris, where she worked as a freelance proofreader and translator. She translated into Spanish such French authors as André Breton, Aimé Césaire, Marguerite Duras, Paul Eluard, and Henri Michaux. She also wrote poetry and criticism for Latin American, Spanish, and French literary magazines. She was on the staff of the journal Cuadernos and joined the editorial board of Les Lettres Nouvelles. She was part of a literary circle that included leading 20th-century European and Latin American artists and writers, including Julio Cortázar, Rosa Chacel, and Octavio Paz. She continued her studies, taking courses in contemporary French literature and the history of religion at the Sorbonne. Alejandra returned to Buenos Aires in 1964 and continued her intense literary activity. In 1965, her book Los trabajos y las noches was named the best book of poetry by the Argentine Foundation of Arts. In 1969, she received a Guggenheim Fellowship, which allowed her to travel to New York City, and in 1971 a Fullbright. Pizarnik became one of the most significant modern Argentinian poets. She developed an addiction to amphetamines, which caused sleep disorders, and she may also have suffered from borderline personality disorder. 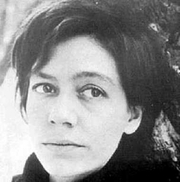 Alejandra Pizarnik died of an overdose of Seconal in 1972. Today there is a monument to her in her childhood neighborhood of Avellaneda. Alejandra Pizarnik is currently considered a "single author." If one or more works are by a distinct, homonymous authors, go ahead and split the author. Alejandra Pizarnik is composed of 3 names. You can examine and separate out names.